Discovery Channel should feature Oregun-area rats abeg! That's the outdoor scenery. Inside, these wall geckos...they're living well, making babies. The best thing is how happy they are when they're hunting and eating - their joy so infectious! I keep wanting to do a phototour or walking-guide of this town. Tucked away somewhere between the Lagos State government buildings of Alausa and the old commercial districts of Allen Avenue and Ikeja GRA, the town has all this unpretentious food, pretty views, and diverse entertainment. It's known for the industrial estate and a lot of other industries, especially the faith industries (wink;) - the headquarters of Pastor Chris Oyakhilome's Christ Embassy, Pastor Chris Okotie's Household of God, Pastor Sam Adeyemi's Daystar Christian Center are each within ten-minutes, walking, of the others. I've visited all these. Household of God has a gorgeous, almost Victorian yet over-the-top, frilly, beautifully lit interior. Divine music. High entertainment value. Sorry that I visit churches for entertainment. You really should see these places. One day a friend took me to this marble edifice, Lord knows how many floors, that is some sort of religious center too, on some hidden street. There's a Mountain of Fire or two, and I guess all the usual church brands. I'm Catholic, and one Ash Wednesday, I went to the local Catholic Church. There's a Daystar offshoot - forgot the name - that grew very fast and then maybe stalled or moved; had the couples and matchmaking and career development and drive-for-success and all that stuff Nigerians like in their Sunday morning entertainment. I remember when I lived next to the Mountain of Fire and Miracles' Yaba Headquarters. O wow. They prayed without ceasing, like the Bible says to do. First in the morning, last at night, for the fruit of the womb, for promotion, for annihilation of the enemy, by fire! I don't know of any major hotel on its streets, but many motels and potels. One little place that sells decent rice is at Number 69 on the main street. 69 in black paint on the yellow and orange house. Inspiring, hard to forget. Rooms upstairs I hear. I don't know if they have girls on site or not. I discovered a major theater company practically next door. On Saturdays there are the famous event centers for weddings and owambe parties so lots of nice cars parked on the main road. For those who can't afford such, the schools serve as event centers. You can hear the MCs calling on the old people to dance to these young-people tunes. The kids screaming, having the time of their lives. The straight-from-village people - and by this I really mean, buses full of villagers in brightly-coloured 'aso-ebi' uniform-wear come into town to leave the same day - feeling funky, following the same wedding format as island babes from Devonshire and Herefordshire, complete with 'catch the bouquet' , the music - Beyonce: All You Single Ladies / Put a ring on it. It all cracks me up. Radio and press and magazines, media and advertising- 234next.com / NEXT News used to be right down the street. Lots of stuff I don't know but maybe will find out. Back to food: I know a half dozen suya and so-called barbecue spots, some I wouldn't touch because my tummy, I don't know if that stuff's safe. The other day I saw my favourite suya guy who'd been gone for a year or more. I can't explain how likeable this dude always was. Apparently he's now been hired at this place (pounded yam / finger yam spot) where the suya guy died last year during Lagos' ebola scare, not of ebola, but that tale scared me from eating suya/bbq there for a while. I mean, they said he just dropped dead or something strange. I'm hoping the idea of developing multiple 'areas' and their cultures and businesses takes hold in Lagos. It can't be all about overpriced Victoria Island, right? 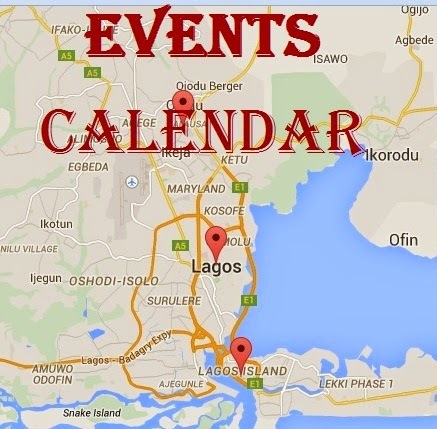 That's why I did up this events calendar. Maybe folks will use it. Somebody outside just farted. A soulful uninhibited fart. It's the cleaning lady. Let me go say hi. by the way, those (American Tail) rats were skinny rats. These (Ratatouille) ones are healthy cats, I mean, rats. The ones I'm talking about, they're prosperous, corpulent, ... I would call them giants, but I looked up giant rat images and eeww, yucch, Lord, those are scary.